State education officials have released the final draft of proposed social studies and science standards. The standards spell out what Minnesota students will be taught about history, geography, government, economics, and science. The first draft was heavily criticized as too long, too Eurocentric and too fact-heavy. Education Commissioner Cheri Pierson Yecke says the new versions address the critics' concerns, but some still have reservations. St. Paul, Minn. — When the first draft of the social studies standards was released in September, it prompted a wide range of complaints. Some people said it contained too much material for teachers to cover in a school year; others said the standards were not age-appropriate, and some critics said the standards reflected a conservative viewpoint of history. Education Commissioner Cheri Pierson Yecke says the academic standards committee heard the concerns, and made major revisions. "Just about at every public hearing, people pointed out 'first graders knowing how migration and colonization influenced American history' might not be something that first graders were able to do. 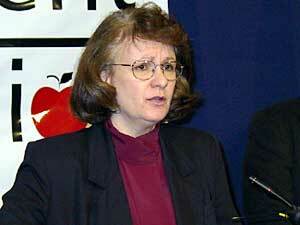 These benchmarks have either been eliminated or moved to higher grade levels," she said. Yecke says the number of benchmarks that teachers are required to teach has been scaled back for both social studies and science. In response to the criticism that the social studies requirements were heavily focused on white, Western history, Yecke says the new draft adds material on Asian, African and indigenous cultures. Committee member Todd Flanders, a Catholic school headmaster and leader of the high school history committee, says the standards also reflect political balance. "One of our tremendous oversights in the first draft was (no) mention of John F. Kennedy's administration by name. I believe that we talked about events that were there; it was an unintentional oversight, as were most of ours, and with good public input, we thought, well, definitely, we must get that back in," Flanders said. The standards refer to 11 Republican politicians ranging from Abraham Lincoln to George W. Bush, and 10 Democrats, including FDR and Jimmy Carter. Flanders says the new draft also covers women and minorities more thoroughly. Yecke says the revised standards include more emphasis on analysis and explanation, in response to charges that the documents focused on facts instead of critical thinking skills. The social studies standards include a new area called "essential skills," that require students to apply what they've learned. We're interested in accurate science, and creationism gets into things based on Scripture, and that's not something that belongs in the science classroom. The chair of the Senate Education Committee Steve Kelley, DFL-Hopkins, says he's encouraged by the changes. "There are some good signs of progress in this draft. Whether they went far enough to reduce the potential hubbub, we'll have to see," he said. Kelley's committee will hold a hearing on the new drafts on January 23. The 2004 Legislature must approve the new standards, and Kelley says it's possible lawmakers could make major changes in the latest versions. One member of the social studies committee plans to submit a minority report expressing concerns about the process used to develop the standards. Mary Tacheny, a St. Paul elementary school teacher, says the timeline was too short. "In any school district, when you're picking out just a new curriculum textbook, you take more time studying it for the year. And we threw together from November 1 until now the final produce of what will dictate K-12 social studies education in the state of Minnesota. That's pretty pathetic," Tacheny said. While the social studies standards generated most of the controversy, the science standards raised concerns of their own. Some science teachers said too many requirements would leave little time for experiments and lab work. And four members of the science committee submitted a minority report expressing concern about the language on evolution. One of the four is Dave Eaton, an engineer and Minnetonka School Board member, who says students should know that there is scientific criticism of key aspects of evolutionary theory, even though the biblical theory of creationism isn't being taught. "We are very clear in our document that we're not advocating creationism. We're interested in accurate science, and creationism gets into things based on Scripture, and that's not something that belongs in the science classroom," he said. The science standards also added a section on environmental studies. If all goes as planned, schools will start implementing the sciences standards next fall, and the social studies requirements the following fall. Commissioner Yecke says she's proud of the final draft, and says people should keep an open mind and judge the documents by their content.